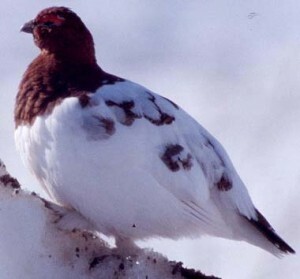 The Ptarmigan is the State Bird of Alaska. The Rock Ptarmigan is seasonally camouflaged; its feathers moult from white in winter to brown in spring or summer. 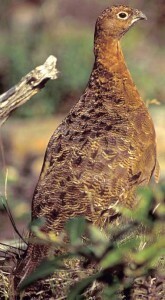 The breeding male has greyish upper parts with white wings and underparts. In winter, its plumage becomes completely white except for the black tail. It can be distinguished from the winter Willow Grouse (Willow Ptarmigan in North America) by habitat — the Rock Ptarmigan prefers higher elevations and more barren habitat; it is also smaller with a more delicate bill. The male’s “song” is a loud croaking. Because of the remote habitat in which it lives, it has only a few predators—such as Golden Eagles-and can be surprisingly tame and approachable. The Rock Ptarmigan feeds primarily on birchand willow buds and catkins when available. It will also take various seeds,leaves, flowersand berries of other plant species. Insectsare taken by the developing young.